To begin with, this very issue is a strange question in itself: how can you say that there should be concrete and precise geographical roots for a mythical story? On the other hand, the book argues in a very powerful way that there might be some Nordic or Baltic origin of phenomena arising eventually in the Mediterranean region and close links between the North and the South of Europe. In truth, we can say that the book provides a whole new perspective on the ongoing process of European unification, because the classics might have been since the beginning part of the larger whole of Europe. From this perspective alone, the book contributes significantly to European integration in that it revolutionises and redescribes Europe’s cultural foundations. To be frank, after reading the book, you hardly believe what you have read, namely that the famous, ancient Greek stories of Homer originated in Scandinavia. Indeed, it is recommended hereby to read the book more than once in order to get an objective overview of the ideas presented in the book. This edition of the book is a translation of the English version of the Italian volume Omero nel Baltico. Le origini nordiche dell’odissea e dell’iliade by Felice Vinci (5th edition, Palombi Publishers, Rome Italy), introduced by Rosa Calzecchi Onesti, a renowned scholar and translator of the Iliad and Odyssey into Italian. The author has travelled to many countries to propose his thesis and the ideas of the book, which may baffle prima facie, have been received as worthy of consideration in many academic quarters. For one, the volume has been adopted as a textbook for the students of Bard College in New York in 2007. And in order to experience the story, a professor of classics at Bard College has been sailing with his students on Ulysses’ course, as this is charted in the book; the event being supported by the US Oceanographic institute. Many American scholars have stated that the book is very interesting and provides new perspectives on Homer and his ideas. The fact that the book is used by the students at Bard College also shows how important Vinci’s work is as regards providing a completely new contextualisation of the works of Homer. When we think about the importance of the Iliad and Odyssey for European culture, it is mesmerizing to meditate upon the possibility that these poems may describe events and peoples from old Scandinavia, as it is stated in the book. Besides, although revolutionary, the thesis of the book is not entirely new. Many researchers have argued that the origins of Homer’s stories may have a basis in a broader European setting. Under this perspective, it is most interesting how Vinci bases his analyses on concrete interpretations of the peoples, natural landscapes and travels described in Homer’s Iliad and Odyssey. The book argues that the geographical description of Homer’s poems corresponds to different Scandinavian and Nordic islands, for example some Danish islands, such as Lyo, Fyen Langeland, Tåsinge and Sjælland. And it is in the Danish island next to Fyn that Ulysses is supposed to have had his home. At the time Homer wrote, according to Vinci, there was a much warmer climate in the Nordic countries; hence there is no obvious climate argument against the notion that those parts of the world could have been at least as populated and active as the Mediterranean area. We can also find much resemblance between the Nordic stories of different heroes and the stories presented in Homer’s poems. Perhaps some of the Greek tribes may even have come from the Baltic region. The first part of the book offers an in-depth analysis of the world of Ulysses. It discusses where we should locate geographically his home and it shows how we can find the tracks of his travels in the Baltic and also in other parts of the Scandinavian and Atlantic regions. This part of the book also makes a comparison between Nordic mythology and the Greek world and it discusses how the Greek world bears many resemblances with Nordic mythology. In particular, the author tries to identify Ithaca with the Danish island of Lyø, near Fåborg and Fyn, Fyn itself being described as the “dark” countryside. In general, this is the part of the book in which the author tries to show most carefully how specific geographic places in Scandinavia can be identified as places in the Odyssey. The second part of the book discusses the geographical reality of Troy in the Nordic regions, on the basis of the descriptions provided in the Iliad. This part also tries to link the Trojan War with remote events in the Northern countries. According to the book, Troy was not situated in the Mediterranean Sea, but rather along the Baltic coast of Finland. On this basis, the third part of the book tries to show how the myths of classical Greece have their origins in the Nordic—i.e. Baltic and Scandinavian—mythology of ancient times. And it is further shown how the climate at the time was very different, in order to support the idea that the events narrated in Homer’s Iliad took place in the Baltic and Scandinavian regions. The fourth part of the book discusses the relations between the myths of Scandinavia and the Baltic region with those mentioned in the works of Homer. Finally, the book contains discussions of the reasons for the migration of Nordic populations to the Mediterranean regions commonly associated with classical Greece. The book is very provocative to a hermeneutically or textually oriented literary critique, because it takes the scientific and positivistic reading of literature and of the origins of literature to their extreme point, by searching for geographical explanations of all aspects of Homer’s fictional works. The logic implied is such that Homer’s poetic depictions must correspond to specific places and that there must be a real-world explanation to the structure of the literary universe deployed therein. However, we have to understand that literature is characterized by being something that proposes an imaginary universe, which carries only limited adherence to reality. This is also the case with the Iliad and the Odyssey, which are, pace Schlimann’s and Blegen’s archaeological excavations, works of fiction that create an imaginary world that you can enter and live in. As such, they possess only tenuous connections with actual reality. However, apart from its stark break with the methods of literary hermeneutics and the idea of the non-reference of a literary work, we can also try to read Vinci’s book as partly a literary text itself. It is not just or perhaps not even mainly a scientific book. It is rather a dream about a hypothetical world in which the classical Greek myths are also Scandinavian. And why not? We can enter this new literary world of Troy and Ithaca and all the other mythical figures of the Iliad and Odyssey and we can conceive of ourselves as both Vikings and people from the classical world. After all, this is the privilege of the European civilization, which combines the North of Europe with Southern Europe and their rich legacies of myths and literary works. I therefore recommend the reader to enjoy the book on its own premises and dream about the adventures of the classical and Nordic worlds at the same time. The book tells, and documents, the author’s journey following his original intuition: can the geography described by Homer in his epics be related not to the Mediterranean coasts and towns, but to the Scandinavian ones? Vinci pursued such an ‘experiment’: he tried to fit Homer’s places into the Scandinavian context. And according to Vinci’s studies, partially supported by further studies by Nilsson and Tilak, the protagonists of the Iliad and the Odyssey could have actually lived and performed their heroic deeds on the coasts of the Baltic Sea. One of the starting and strongest points of Vinci’s research is already suggested in the ancient historical sources: Plutarch stated that Ogygia island, where Calypso kept Ulysses for several years, was in the Northern Atlantic, five days of navigation away from Britannia. Then, the evidences mingle with an unstoppable sequence of facts and hypotheses, reasonings and dreams. For example, why is it said that the island of Faro, in front of Egyptian Alexandria, took one day of navigation from Egypt? As Vinci bears witness to with his studies, the names of Homeric places still overlap with the names of Northern villages and cities. The same applies to the distance between towns, the description of the warriors’ garments and habits, as further substantiated by well-documented archaeological and historical studies that match Vinci’s peculiar theory. Furthermore, there is an answer to the issue of the climate described in Homer’s poems: the Baltic Sea was warmer at that time, just before the end of the ‘climatic optimum’ that forced Nordic populations to move to warmer places, i.e. to the Mediterranean area. As the cooling of the climate is concerned, I must confess that I felt myself shivering: what an intellectual vertigo does induce Vinci’s notion, whereby Europe’s classical culture shifts suddenly northward. Torn between my Mediterranean birth and my sympathy for Nordic countries, having visited Greece and the ‘epic’ places of Achilles and Telemachus, I still find it difficult to accept the idea that Ithaca may be one of the Danish islands, Troy to be in the Gulf of Finland, Crete in Pomerania, and Mycenae, perhaps, the ancestral cradle of today’s Copenhagen. Not to mention Ulysses–thus interpreting Tacitus’ definition–being a forerunner of the Vikings, maybe even the Ull recalled in the Edda. Yet, as the classical scholar Rosa Calzecchi Onesti states in the foreword to Vinci’s book, none of the great previous researches on Homer’s geography is in doubt, because Vinci argues that such Northern populations recreated a second ‘Baltic’ along the Greek coasts and islands. As historical novelist Franco Cuomo writes in the preface, Vinci’s book must be “read like the memory of a population who, moving elsewhere, brings along its own myths” (p. 9) . Vinci’s book evokes Homer’s epics as a primordial portrait of a ‘greekness’ that we have learned to know and imagine through classical texts, visual arts, movies, travels, etc. We know that history is crowded of misunderstandings and misinterpretations, and Vinci’s theory shall be seriously considered as a new approach to Homeric and classical studies. The book suffers from the poor quality of the pictures contained therein. Also, I cannot comment on the conclusiveness of Vinci’s revolutionary thesis. Still, I can appreciate its originality, the personal approach of Vinci when he recalls his journeys throughout Scandinavia, the careful descriptions of the landscapes he visited and their comparison with well-known Homeric places, and the wealth of historical sources cited to support his stance. A recent putative contribution has come from an Italian engineer named Felici Vinci, who published a book called Omero nel Baltico. 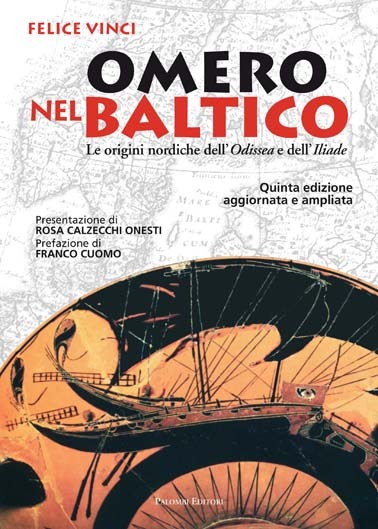 Le origini nordiche dell’Odissea e dell’Iliade, in 1995, translated into English as The Baltic Origins of Homer’s Epic Tales (Rochester, VT, 2006). Vinci’s thesis is that the Achaian Greeks lived, in the early 2nd millennium B.C., in the Baltic region, and emigrated thence to their more commonly supposed homeland in the Aegean, in the middle of that millennium, conquering the Minoan Cretans and seizing control of the Helladic mainland where they installed themselves in and augmented the fortress settlements and palaces of the ‘Mycenaean’ civilization; and bringing along with them oral ‘texts’ of what we know as the Iliad and the Odyssey. According to Vinci, these texts describe events of heroic saga originally located in the Baltic and North Sea areas, in great detail. When the Achaians (or Danaans–whose name really represents, or is cognate with, for Vinci, the Danes) settled in the Aegean, they gave names of the ‘Homeric’ locales to sites in the new homeland–but imperfectly, or not fully successfully or consistently. (For how could one expect a perfect match between itineraries and topographies which do indeed fit perfectly geographical realities of Finland, Estonia, Britain, and other northern European settings, and what is to be met with in Greece, Turkey, and southern Italy?) After oral transmission for, apparently, about 900 years, the great epic poems were at length written down in 8th or 7th century B.C. Ionia, no one suspecting that they had had this original northern genesis and passing on until Vinci appeared on the scene. One’s initial reaction is indeed to see this as on the crackpot not the inspired genius side of the ledger. Vinci makes, though, a detailed case; and at least a few investigators, including some classicists and archaeologically-informed scholars, have concluded that that case has arresting substance, and merits judicious consideration, at least. Thus the workshop, at the site indicated–Toija, Finland, the supposed original of Troia, or Troy–and the volume of workshop proceedings under review. On a very general plane the idea at the centre of Vinci’s thesis is by no means impossible. At any rate, there is at least one confirmed parallel, of sorts. There is impressive, indeed initially astonishing, evidence–confirmed presence–of an Indo-Aryan-speaking military cadre of chariot warriors in 16th-century Syria, worshippers of Indra, Varuna, Mithra, and the Nasatyas (the Divine Twins) far, it would be supposed, from their Indus-valley homes. Although the Mitanni kings they served were of a non-Indo-European-speaking dynasty, those kings took names in Old Indic, and worshipped these gods among others. Evidently non-negligible numbers of Indo-European horse-riding or chariot-using warriors were considerably more mobile, more rapidly, than early prehistorical reconstructions have supposed. There will have been Indo-European-speaking populations in the Scandinavian and Britannic areas in the early 2nd millennium, and trade routes connecting those regions and the Aegean, and migrations of one sort or other in single or multiple stages from north to south could well have taken place. Nor is the idea of such invaders bringing with them folk poetry, including heroic tales in poetic form, at all fanciful. There have independently been argued to be a number of mythic motifs appearing in the mythological and legendary materials which have survived of a number of the Indo-European cultural communities, including some with Homeric provenance–e.g., the motif of a princess captured by a foreign prince, then pursued and retrieved by a pair of brothers. (A story which of course happens twice, in the Hellenic versions, to Helen of Troy–an earlier seizure, by Theseus, with pursuit and retrieval by the Dioscuri, and then the better-known capture, by Paris, with successful pursuit by the Atreidai.) It is not at all impossible, finally, that two reasonably lengthy and complex heroic tales might have been transmitted orally over some centuries before being recorded in writing. So far, so–reasonably–good. The devil, in these territories, is in the details; and the details, for Vinci’s theory, don’t really turn out particularly impressively well. First of all, he insists that there are immense improbabilities or problems in the Aegean or Mediterranean localizations which we find in the Homeric poems. There are indeed some: puzzles or perplexities which have posed themselves from the beginnings of the attempts which the classical Greeks made to locate Homeric sites, or identify and coordinate Homeric topography. These need to be put into three categories: places in the Greek world proper—the Greek mainland and its offshore islands—which at least seem (and seemed to the ancients) to be more or less familiar places, some still inhabited, some not; the sites of Odysseus’s wanderings, in the Odyssey; and places presented as or implied to be real, either not certainly locatable or identifiable, or outside the Greek world proper. The identifications or places in the latter two categories are, obviously, somewhat unstable. Some think all of Odysseus’s landfalls are pure poetic invention, some adding that their topography may well correspond frequently to real places known to the poet even if the supposed sites themselves are fictional; others think that some of these sites are real, but that it will be wholly unsurprising if details are garbled and, again, some genuine topographical description get mixed up with fanciful pieces of putative detail; and others of course think that an actual sequence of voyage and landfall, at precisely conceived locations, is intended and recoverable from the poem. It should be plain that a theory meaning confidently to tell us where Odysseus went is going ipso facto to be on shaky ground. The second category of places also provides a weak reed for reconstruction. Much had changed, and much early geographical information or speculation will very naturally have altered in the centuries between the monumental Homeric compositions and the investigations or commentary of ancient scholarship, such as it was; and—as Vinci’s own theory will also imply—much which appears in the 8th-century Homeric texts will itself fossilize or record items from long before that time. As for what Homer says or implies about places in (what is now) Greece itself, there are actually only a few true puzzles, and they are dwarfed by what is otherwise an incredibly detailed geographical account which—not to put too fine a point on it—fits Hellenic realities like a glove. Even the puzzles—Homeric Ithaka implied to be a westmost island in a group of four, for example, when the historic Ithaka at least wasn’t westmost in its island group—can readily enough be accounted for as errors or confusions stemming from a poet probably living in Ionia, i.e., in the eastern Aegean, describing an archipelago he may never have seen (even if that poet wasn’t in fact blind!). The fact is that the classical or traditional conception of settings isn’t genuinely in such particularly bad shape. And the further facts are that Vinci’s own lengthy and detailed identifications have immensely less to recommend them than he, or his advocates, claim. Much is made of the huge number of proposals of matches which Vinci makes. The whole enterprise is wholly uncontrolled. If Vinci finds a place name in contemporary Finland, or elsewhere in the Baltic, which bears the most remote similarity to a name of a place or people in Homer (or, for that matter, anywhere in the post-Homeric legendary or mythological corpus), and which can then be fit into a larger geographical scheme to correspond to details of story in Iliad or Odyssey, it is added to his ledger. In fact if his thesis were sound, these names would have to have been employed, for the places they now name, prior to 1500 B.C., entered two large epic poems of about that date, then been preserved orally for eight or nine centuries before being recorded in writing and transmitted thereafter. Credulity is stretched, frankly, to breaking point with the accumulation of these transitions, and assumptions. Vinci’s advocates, among them an American professor of classics, William Mullen, of Bard College, also make arguments that do not pass muster. (Mullen’s contribution comprises well over 40 % of the volume under review.) Mullen notes that people (and peoples) bring place names with them when they emigrate, and apply them to new domiciles in their new homes. Indeed they do. What Vinci’s case requires is however more than this: namely, people applying place names from stories they bring with them to new places, in geographical orderings that correspond to those of their stories. It is doubtful whether there is a single well-attested case of this to be found among any culture or period in the history of the world. Again, a thesis that ancestral versions of the Homeric poems might have had an original provenance and setting elsewhere than in the Aegean region, from a period prior to the Middle or Late Helladic periods, and, perhaps, that such an origin might have been in the Baltic region, faint but detectable echoes of which can arguably be discerned in or recovered from the poems—this might be an idea worth listening to, or considering. That the Catalogue of Ships of Iliad 2 is a verbatim transmission of an oral record of the geography of Sweden and Finland in the earlier 2nd millennium B.C., is not. (Vinci calls it (31) “an extraordinary ‘photograph’ of the Northern Early Bronze Age peoples”.) The linguistic history of Greek is fairly well understood. Many of the formations in the Homeric poems, including many repeated originally oral formulae, and including as well formations and formulae found in the Catalogue of Ships, are of demonstrably “late” provenance—i.e., not earlier than the eighth century B.C. (just as many are of probably much earlier, even Mycenaean origin). It is not possible that the Iliad or the Odyssey, or any distinct part of either of any significant length, is an intact transmission from any period in the second millennium B.C. This will not preclude Bronze Age survivals that have been partly or significantly “recomposed” in later diction—options which are argued for the descriptions of the boar’s tusk helmet in Iliad 10, the tower shield, other ‘heirloom’ objects, and perhaps the two Catalogues of Iliad 2. But every transmission which innovates linguistically increases the likelihood of change of content, including distortions. The distance from 1500 B.C. to a written Homer is a long, long one; and there is no serious reason to view Homer as other than Aegean Greek. The Vinci thesis belongs in the dustbin; or wherever it is that fantasies about literary originals should be put.